Andy’s Bread is a small artisan bakery based in Llanidloes, Powys. Their range includes slowly fermented rye and wheat sourdough breads, traditional tin loaves and viennoiserie products. Andy is passionate about local food made using quality ingredients. 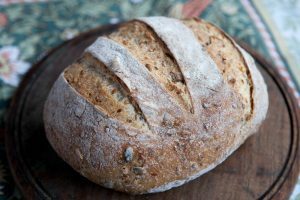 All Andy’s Bread is hand crafted using high quality flour, including stoneground wheat, spelt and rye by Felin Ganol in Llanrhystud (south of Aberystwyth) and Shipton Mill organic flour. All his vienoisserie products are made using organic milk and butter from the Welsh Organic milk cooperative Calon Wen. He is also part of the Real Bread Campaign, which supports traditional baking without the the use of processing aids or any other artificial additives. 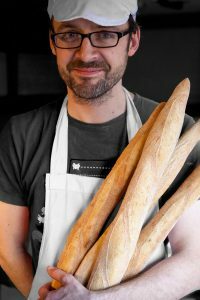 Andy will be running bulk baking sessions to bake the bread for the café each morning. Come and join in and learn to bake beautiful bread. The Bakery is open all weekend with sessions on Sourdough, Cakes and plenty of time for Bake-Off teams to prepare.